It started with radio chatter about a gas rig blowout heard on a research vessel early Tuesday morning. A few days later an all-star science team from across the Gulf region sailed from Cocodrie, Louisiana on the R/V Acadiana to the Hercules site. The vessel was loaded with ocean drifters to track movement of surface waters around the rig and with equipment to collect time-sensitive samples of water, air, and sediment. 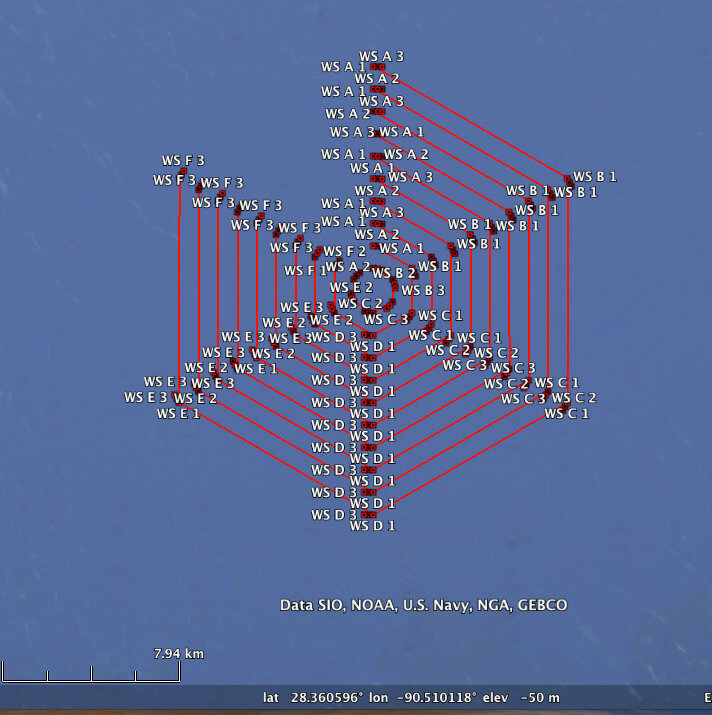 Working with federal authorities, the research team received sampling access to within 500 meters of the rig. A flurry of emails and phone calls on Tuesday turned into meetings on Wednesday. Researchers quickly generated real-time models to support plans for drifter deployments and sampling sites and obtained use of a vessel. On Thursday and Friday, teams loaded equipment into vehicles or hurriedly prepped them for express shipment and then travelled to Cocodrie and loaded the vessel. The first expedition left port on Saturday 6 AM in bad weather and rough seas and sailed to the incident site. That afternoon and evening, despite challenging conditions, drifters were transmitting GPS signals of their movement and researchers began collecting water and sediment samples. The crew returned to port around midnight for rest and supplies. On Sunday evening the vessel left port again and science crews continued their work through Tuesday, successfully gathering important data. This gas-well blowout represents a unique opportunity to document impacts of contaminants in a shallow water environment. The foresight, resourcefulness, and collaborative efforts of these quick-acting researchers should give the public, responders, and other scientists key information about the incident arena, at essentially its beginning, to better understand impacts as this event evolves. (Click to enlarge) CARTHE provided this image on July 27, 2013, 12:27:09 PM CDT. Drifters reveal the ocean flow near the Hercules gas rig. Steven Murawski, a fisheries biologist and marine ecologist with the University of South Florida and director of C-IMAGE, expressed a similar perspective, “Having GoMRI scientists on ‘speed dial’ created an efficient response network with the expertise to address important issues.” Brian Roberts, an ecologist and biogeochemist with the Louisiana Universities Marine Consortium (LUMCON) and CWC, concurred saying, “The established GoMRI consortia made us all aware of the different expertise that consortia members have, making it easy to find the right people who are primed to contribute to a rapid response collaborative project.” Piers Chapman, a marine chemist at Texas A&M University (TAMU) and director of GISR, attributed “GoMRI as a catalyst” for this effort. In the early morning hours on Monday July 23rd, the Hercules 252 rig owned by Walter Oil and Gas of Houston, TX blew out, spewing a mixture of gas, condensate and possibly other hydrocarbons into the water and air. 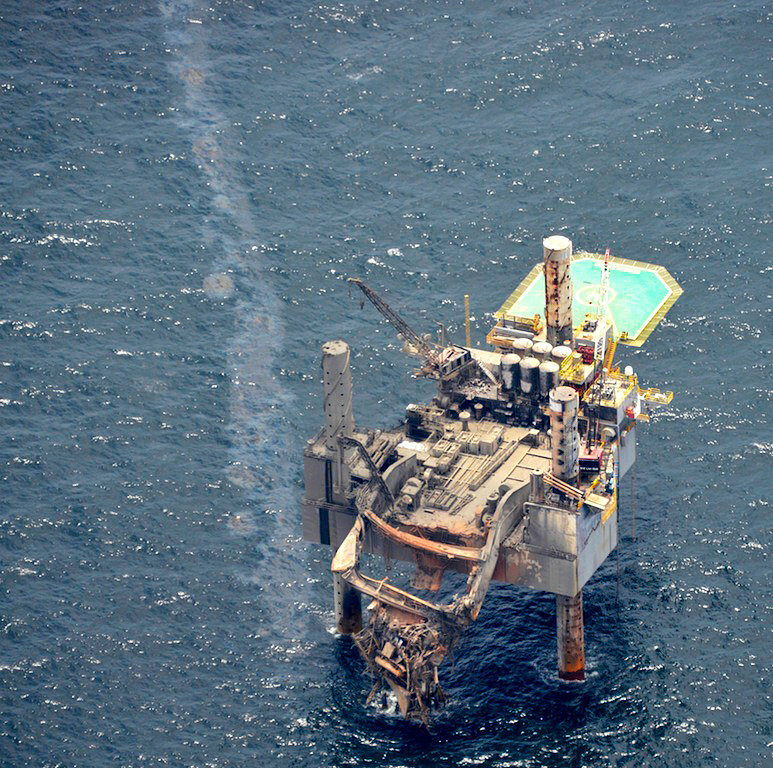 The rig is located about 55 miles south of the Louisiana coast. All workers on the rig were safely evacuated. Surface sheens periodically became visible and then dissipated at and around the blowout site. Later the rig caught fire and continued to burn until, as authorities believe, sand and sediment clogged the well, temporarily shutting off the gas flow. Responders are preparing to dig a relief well for a permanent plug. 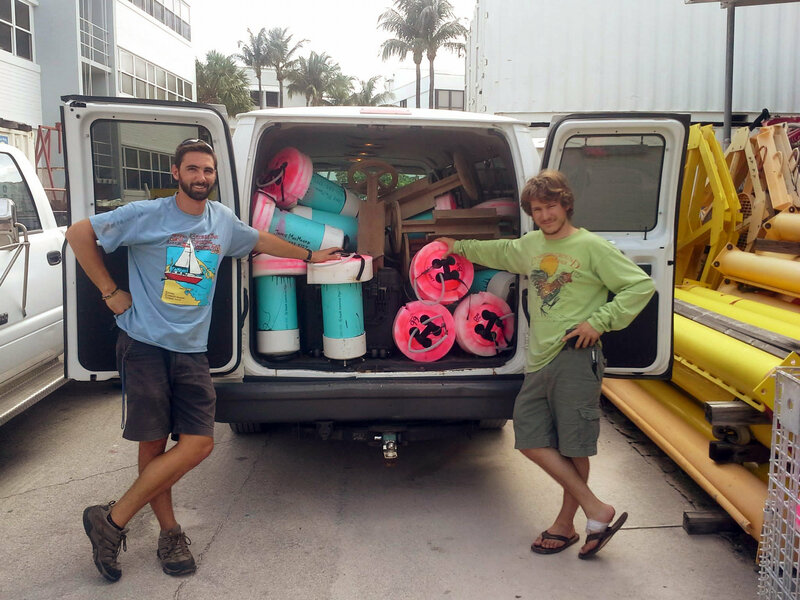 (Click to enlarge) University of Miami Ph.D. students Conor Smith and Nathan Laxague are ready to drive to Cocodrie, LA with a van full of CARTHE drifters. They deployed 21 drifters around the blow out site and the drifters are tracking the movement of surface waters, showing where potential contaminates may travel. Everything seemed aligned for this team to respond rapidly to the blowout. Joseph Montoya, a biological oceanographer and biogeochemist with the Georgia Institute of Technology and ECOGIG, was on the R/V Endeavor in the Gulf of Mexico when he heard the radio chatter. Montoya notified his colleague Joye about the incident and coordination began. In Joye’s search for a vessel and help to coordinate a science team and plan, she learned that several colleagues were at a University-National Oceanographic Laboratory System meeting: Vernon Asper, a marine geologist and geophysicist with the University of Southern Mississippi and ECOGIG, and Joe Malbrough, LUMCON’s marine vessel supervisor. They arranged to charter the R/V Acadiana. Also at that meeting was oceanographer Steven DiMarco with TAMU and GISR. DiMarco contacted Chapman and Terry Wade, a chemical oceanographer at TAMU and GISR. Together they developed a science plan to collect samples for hydrocarbon analysis. Joye and Roberts were collaborating on a different at-sea field effort but immediately changed their focus to this event. Roberts handled vessel logistics, providing critical information on space, equipment, and layout, and he kept good communications going with the captain. He coordinated receipt of overnight shipments and housing arrangements. Graduate student Tiffany Warner, with LUMCON/Louisiana State University and CWC, assisted on-site as the groups arrived and loaded the vessel. Joye contacted Tamay Ozgokmen, a mechanical engineer with the University of Miami and director of CARTHE, for drifters to track surface waters. Ozgokmen’s team prepared a deployment plan and sent Ph.D. students Conor Smith and Nathan Laxague, experienced in deploying drifters, to Cocodrie. A modeling team formed to support understanding of how a shallow water blowout evolves under gas dynamics: Ozgokmen; Murawski; David Hollander, a chemical oceanographer with USF and C-IMAGE; and a GISR team at TAMU: Scott Socolofsky, a coastal and ocean engineer; Xiaoqian Zhang, a physical oceanographer; and Raffaele Montouro, a computational scientist. 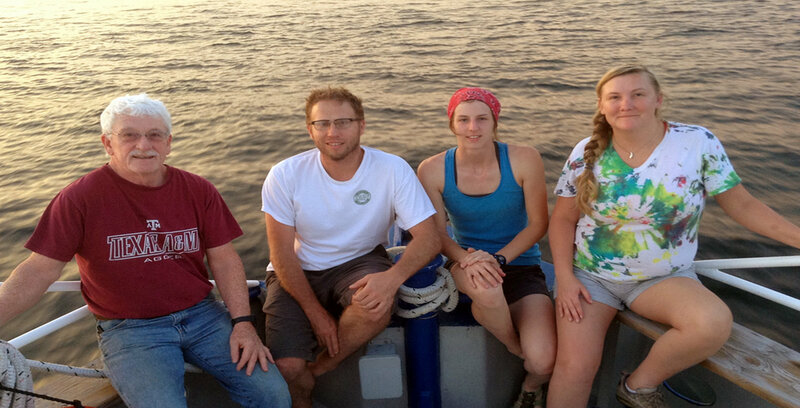 Montoya left the R/V Endeavor and joined the team in Cocodrie for the Saturday expedition. With him were Wade and graduate students Sarah Weber (Georgia Tech), Joy Battles (University of Georgia), Warner, Smith, and Laxague. Leigha and Rick Peterson (Coastal Carolina University) and an AP reporter completed the group. The Sunday night through Tuesday expedition included Wade, Matthew Rich (LUMCON and CWC), Warner, Weber, and Battles. released drift cards in support of the GISR Drift Card Project. Researchers are analyzing these samples for natural gas, hydrocarbon, and isotopic concentrations; oxidation and respiration rates; microbial production; volatile organic compounds; geochemistry; and for radium and radon. 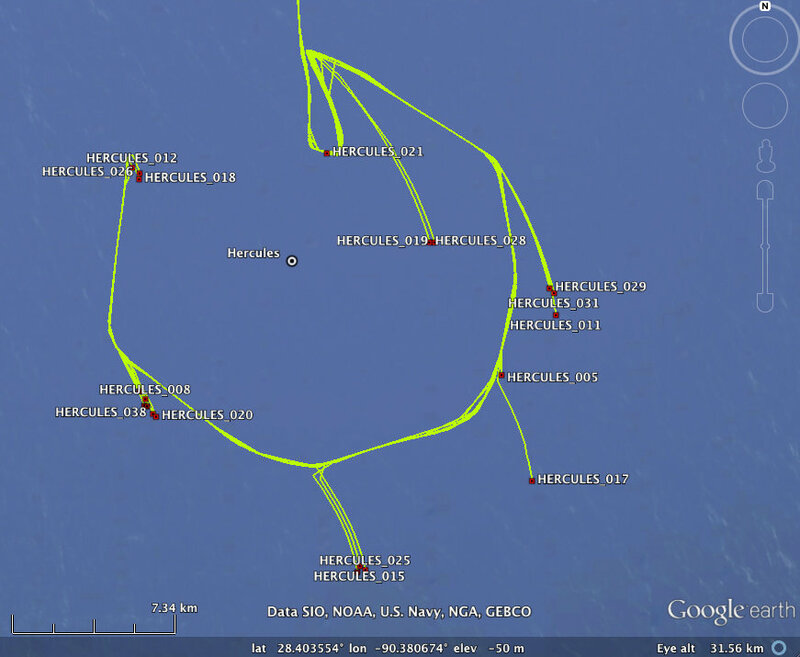 This collaborative drifter and sampling effort will help improve understanding of surface and below surface dynamics. 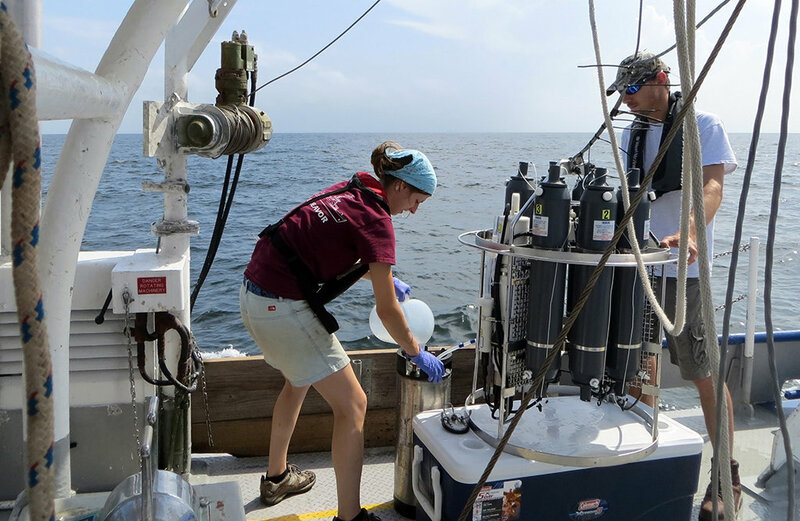 The models will also help C-IMAGE scientists in August for a previously-planned two week field effort of sediment coring and longlining for fish contamination in the location of the Hercules blowout. As unfortunate as this event was, it provided an opportunity for researchers to test their “rapid response” plans in a real and serious situation and learn more about the ocean and its response to this and similar events. Additionally, it demonstrated the ability of a diverse group of scientists to efficiently assemble and cooperate for a comprehensive study of the incident on very short notice. Interactions among scientists, the US Coast Guard at the Unified Area Command, and NOAA’s Office of Response and Restoration were mutually beneficial. Researchers gained access within 5 miles of the gas rig, and responders received information coming from field efforts that helped their work. This type of cooperation – a need identified as a lesson learned from the Deepwater Horizon event – provides a model for greater cooperation between academic scientists and government responders. 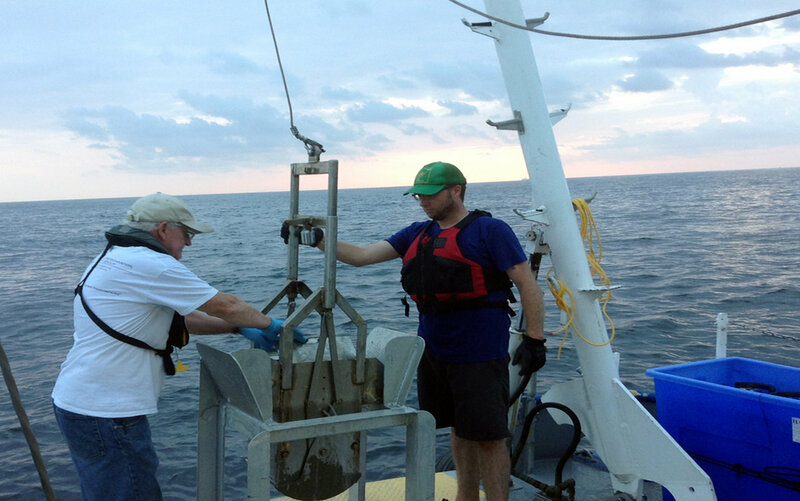 The group hopes that, as a result of this effort, the public will have a better understanding of the long-term benefits of conducting Gulf of Mexico research, in particular the scientific network and expertise that is currently being developed within the GoMRI science community. The research of this group is applicable to current events, such as this gas well blowout, and to future events that impact the Gulf region. This research was made possible in part by a Grant from BP/The Gulf of Mexico Research Initiative (GoMRI). The GoMRI is a 10-year, $500 million independent research program established by an agreement between BP and the Gulf of Mexico Alliance to study the effects of the Deepwater Horizon incident and the potential associated impact of this and similar incidents on the environment and public health.